Continuous hike in usage of data services across India Telecom operators are offering various packages and discount on Internet and Mobile services. BSNL competing with major private telecom operators under tariff and rates. In this competition BSNL offering Unlimited Broadband services under affordable rates with high speed access internet usage the way users are moving to BSNL services to subscribe for Broadband services. 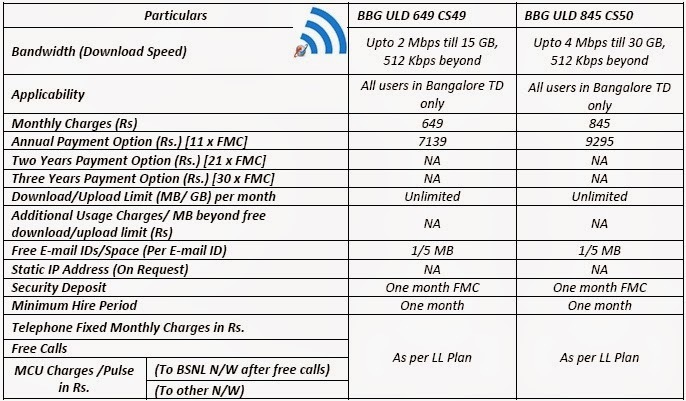 State run Telecom Company Bharat Sanchar Nigam Limited (BSNL) introduced 2Mbps and 4Mbps speed new DSL Unlimited Broadband plans under affordable tariff on promotional basis only to Bangalore Telephone district customers of Karnataka Circle. DSL Unlimited Broadband plans are introduced in Bangalore city under reasonable tariff offers high speed internet services to experience better data access. These DSL Unlimited Broadband plans, Fibro BBG ULD 649 CS49with speed upto 2Mbps till 15GB (512 Kbps beyond) and BBG ULD 845 CS50 with speed upto 4Mbps till 30GB (512 Kbps beyond). BSNL Bangalore customers have an option for payment of Annual subscription with special discount of one month on total Year subscription amount. New DSL Broadband plans are applicable in Bangalore Telephone District (of Karnataka Telecom Circle) customers only on promotional basis for a period of 90 days. The above plans will be implemented from 10-11-2014 by following promotional period.